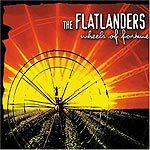 CD review: "Wheels of Fortune"
When the Flatlanders reunited two years ago for their first studio recording since their debut in 1971, it created a buzz of publicity  and sales  that no one anticipated. Few bands have possessed so large a reputation based on so small a recorded output as the Flatlanders. Of course, in the years since their debut hit the market with a giant thud thirty years earlier, band members Jimmie Dale Gilmore, Butch Hancock and Joe Ely had become among the best-known and most-respected singer-songwriters to come out of Texas. Given all that, the absolutely stellar quality of their reunion release only increased the awe in which the band is held by its fans. The problem now is living up those kinds of expectations. And on their follow-up to "Now Again," they fall a bit flat  if only by comparison to that remarkable album. And yet "Wheels of Fortune" is a very good album by most any other standard. It could very well end up being the best country album to get released in 2004. The rich vocal harmonies remain gorgeous, the instrumental interplay is as intricate as ever  and the songwriting is nearly as rewarding. So how can it be all that and still not as good as "Now Again"? Odd though it may seem given the reputation of the individual Flatlanders, it is the songwriting that is the difference between the pure magic of "Now Again" and the mere excellence of "Wheel of Fortune." While the tunes here on the new album are catchy, hook-laden little gems, the fact is that the collection of songs on "Now Again" was as solid a collection of country-folk songs as anyone has ever introduced on one album, with a half-dozen of them likely to become standards of the country & western canon. There are only a couple of songs on the new album of that caliber, most notably "Baby Do You Love Me Still?" and "Wishin' For You." Interestingly, while Ely, Hancock and Gilmore are known for writing multi-layered, complex songs that draw as much on jazz as mainstream country-western, on this album Ely contributes "I'm Gonna Strangle You Shorty"  an outstanding Nashville kind of song that would fit in quite nicely on the latest disc from Shania Twain or Tim McGraw. But let those two wait to record it; for now, we have the Flatlanders' own version, and if it's not quite as magic as the last go-round, it's still better than almost anything else out there.